A legendary gutiar that's ready for the good times and bad. Fender's Jimmy Page Mirror Telecaster is a recreation of a guitar that was at the heart of multiple historic rock-and-roll moments. It has been in the hands of two of the most iconic guitarists in the musical (r)evolution of the 1960s. The original 1959 Telecaster's first owner was Jeff Beck, who gifted it to Jimmy Page in 1966, as a thank you for recommending him to the Yardbirds when Page couldn't take the gig. Page then briefly joined the band and played the guitar with them (he can be seen with it in the nightclub scene in Michelangelo Antonioni's 1966 film Blow Up) and it is one of the primary guitars used in the creation of the first Led Zeppelin album. Now, Fender has created this tribute to the guitar that arguably changed the course of music. 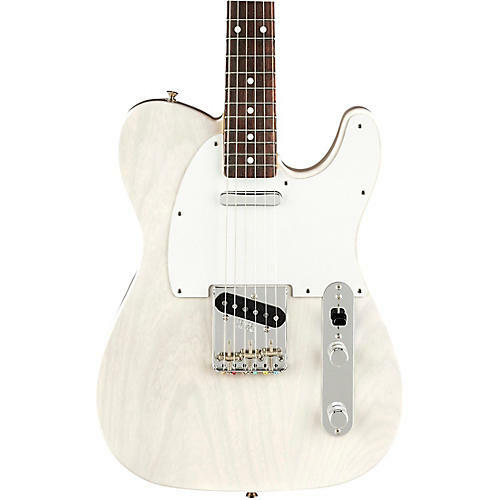 This unique guitar starts with a recreation of the '59 White Blonde, top-loading Telecaster. This was the guitar's appearance until early 1967, when Page added eight round mirrors to the body. While Fender didn't attach mirrors to the tribute guitar, to avoid them being damaged in shipping and display, eight are included with the guitar for you to attach if you want. It's then loaded with a pair of Jimmy Page Custom '59 Tele pickups, wound to deliver the tone that created the incendiary riffage of the first Zeppelin album. The guitar also comes with the top-loading bridge that was standard on 1959, and some 1960, Telecasters. While it can also be strung in the standard string-thru-body manner, the top-loading bridge offers a couple of advantages. Because it reduces total string length, it reduces string tension, which produces a tone that's both warmer and "zingier" (for lack of a better term). These tonal qualities are evident in the original's appearance in Page's much-admired solo on "Stairway to Heaven"
Page himself was heavily involved in the creation of this tribute to the instrument he refers to as "quite a magical guitar," and his signature appears both on the back of the headstock and the custom neck plate. The complete Jimmy Page Mirror Telecaster package also includes a vintage-style hard case, "stained-glass" strap, classic black coil guitar cable and a custom Certificate of Authenticity. Whether you're a rabid fan of Page's career and playing, or simply appreciate an extraordinary instrument, the Fender Jimmy Page Mirror Telecaster is a very special Tele, indeed. With great tone, extraordinary playability and a pedigree that includes two of the world's greatest rock guitarists, it's one that you'll be proud to have as part of your collection. Don't pass up the chance to own this singular guitar. Order your Jimmy Page Mirror Telecaster now. Bridge design:	3-saddle vintage-style "toploader"